How to import to Brazil? What are the import procedures in Brazil to move goods? Explain about import registration process, cargo movement to Brazil from overseas countries, Import delivery process in Brazil etc. 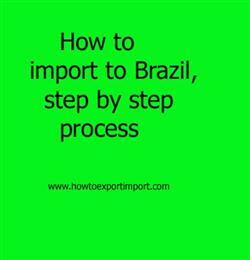 This post explains about step by step procedures that need to be finished with Brazil government authority for importation to Brazil. If you need to import goods or services, a onetime registration procedure is being completed in most of the countries. Such import export licence may be obtained from concerned government department of Brazil if required. In order to perform any foreign trade operation, the importer/exporter must first be registered with Secex through Siscomex. But, before being able to access Siscomex, the importer/exporter will require a Radar license - a license granted by the Receita Federal do Brazil, which is the Brazilian Federal Revenue, different from the Import License, that is issued by Siscomex. The Customs Department of Brazil is under Receita Federal. It controls the import and export activities going on, in the country. There are mainly three categories of permissions required to take import clearance cargo delivery from Brazil customs bonded area. They are Permission from Brazil Customs authorities, Permission from Carrier of goods, permission from custodian of cargo handling at particular import customs port in Brazil. The import documents required to submit with the Customs for getting clearance of cargo. The documents may have to be prepared in a particular way to comply with the requirements of the import or export country. This post explains about different phases in import process that every importer needs to go through in Brazil. Guidelines to import to PORTOALEGRE Please guide to import to PARANAGUA. Help to import to RIO DE JANEIRO. Procedures required to import to MANAUS. Requirements to import to MACAPA. Clarifications to import to ITAJAI. How can I import to FORTALEZA. What should I do to import to ALTAMIRA. How to import to BELEM? Formalities for import to Petrolina. Procedures to import to SANTOS. Need to import to SALVADOR. Explain to import to RIO DE JANEIRO. Information to import to SAO FRANCISCO DO SUL. Step by step process to import to RIO GRANDE. Methods to import to RECIFE.